China successfully launched a pair of Beidou navigation and positioning satellites into medium Earth orbits on Monday with the country's 28th orbital launch of 2018. A Long March 3B rocket with a Yuanzheng-1 upper stage lifted off from the Xichang Satellite Launch Centre in southwest China at 04:23 universal time (12:23 local, 00:23 Eastern). The satellites are the 39th and 40th launched as part of China's Beidou system, following the launch of the first in 2000. 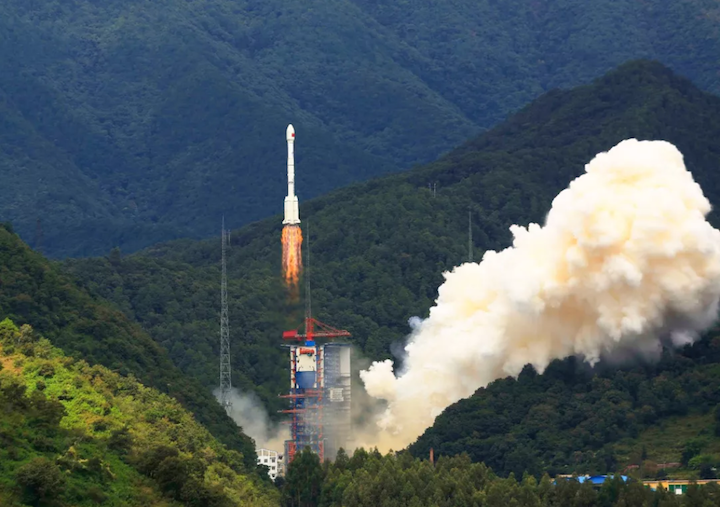 BeiDou-3 satellites launch, 15 October 2018. The Beidou navigation system, which takes its name from the Chinese asterism equivalent to the Plough or Big Dipper, is China's answer to the US Global Positioning System (GPS), Russia's GLONASS and Europe's Galileo GNSS constellations. Systems like GPS and Beidou provide civilian applications such as navigation for shipping and road traffic, mapping and surveying, but also assist military forces from space, facilitating targeting, positioning and locating, and the synchronising of operations. The development of Beidou will end previous Chinese military reliance on GPS. Beidou, also referred to as BDS, is considered a project of national significance and part of the country's national security, economic and social development. China has earlier completed the BDS-1 system to provide positioning, navigation and timing services Chinawide, followed by BDS-2 which provides services across the Asia-Pacific region. The ongoing construction of BDS-3, to establish global coverage, could be completed in 2020. The Beidou-3 satellites launched into MEO are based on a satellite bus that features a phased array antenna for navigation signals and a laser retroreflector with a launch mass 1,014 kg, according to NasaSpaceFlight. However, the previously launched pair included, for the the first time, 'search and rescue' payloads, likely similar to the service planned by Europe's Galileo system. The spacecraft dimensions are given as 2.25 by 1.0 by 1.22 metres, with the satellites usually sent to operate in 21,400-21,500 km altitude orbits inclined by 55.5 degrees. With 28 launches so far in 2018, China has already passed its previous record for launches in a calendar year of 22, set in 2016. The main contractor for China's space programme stated at the start of 2018 it intends to launch up to 35 times this year. Upcoming launches will include the Haiyang-2B marine observation and China-France Oceanography SATellite (CFOSAT), with the latter set for October 29. The Gaofen-7 Earth observation satellite, the SaudiSat-5B technology test and launches of a host of smaller satellites are also expected. Commercial actors including Expace and Landspace will add to the numbers with launches of Kuaizhou and Zhuque rockets. Landspace's Zhuque-1 (Vermillion Bird-1), a three-stage solid-fuelled rocket, will attempt to be the first privately-developed orbital launch vehicle at the end of October. China is still planning further Beidou satellite launches this year using the Long March 3B rocket, another pair to MEO and a single satellite to geostationary orbit. The same launch vehicle will be used to launch the ground-breaking Chang'e-4 lunar far side landing and roving mission in December. An issue with any of these launches will likely delay the launch of Chang'e-4. The white box indicates the Chang'e-4 landing area with the Von Kármán crater, according to a paper from Huang Jun et al, 2018. Huang et al, 2018.